If you know even the slightest thing about me, you know I am a darn sucker for a gyro sandwich. Whether it’s in line at 1am after too much wine in my much younger, more hip days or takeout from our favorite hole in the wall local gas station, I am a proud, obsessed supporter of that perfectly flavored, juices running down your arm, all wrapped up in a pita bundle of goodness. And fortunately, my hubs and kiddos are equally on board. I mean what’s really better than seeing them slice that glorious, salty, savory meat off that spinning spit? It’s magical. I get all giddy just thinking about it. I’ve always wished that I could have my own spit at home…and someday when I have that giant industrial kitchen I’ve been dreaming about it just may happen. But for now, I’m left with no other option than to research the heck out of that there Interweb and find a way to make that melt-in-your-mouth meat sans the spit. And thanks to good old Epicurious, my dreams have come true! This is an unbeatable method, guys, for achieving a truly authentic, perfectly textured and flavored meat. And the best part is that if you can make a meatloaf, you’ll rock the heck out of this recipe! 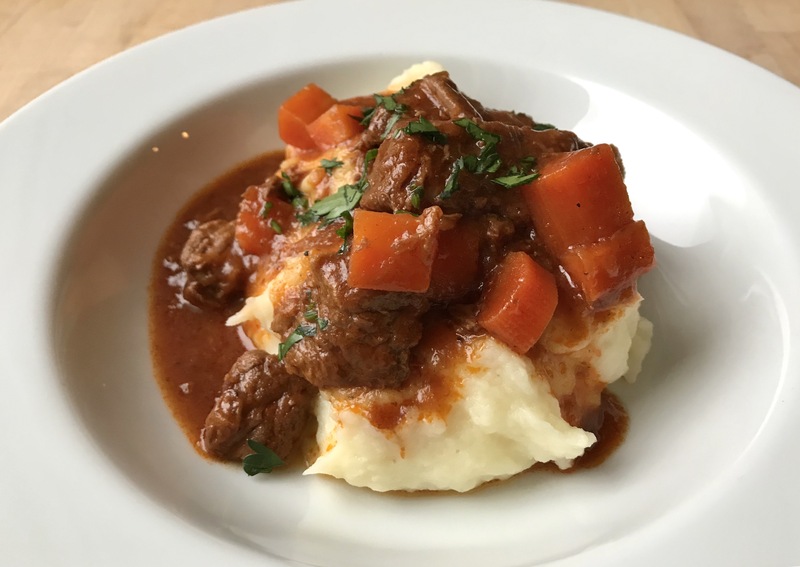 It’s perfect for weekdays…from here on out I’ll make the meat on Sunday’s, let it chill in the fridge overnight and then serve it all week long for quick, easy meals. . The chilling is key so that the flavors all develop and the texture becomes perfectly sliceable. After you make the meat and it has chilled, all that’s left to do is fry it up and pack it in a pita with all the goods. You can also pile it on a salad or serve it bowl-style with rice or quinoa. Winning, friends. Straight up winning! Preheat oven to 375 and grease an 8×8 glass baking dish with olive oil. Grate the onion in a large bowl and add the rest of the ingredients. Stir gently with your hands until combined. Add the meat mixture to the prepared baking dish and gently pack it in and smooth out the top with your hands. Bake for 50 minutes or until nicely browned on top and the edges are starting to come away from the pan. Remove, chill to room temperature and cover and refrigerate for at least 12 hours. When you’re ready to serve the gyros add about 1/4 Cup olive oil to a pan (i use cast iron) and heat over medium high heat. Remove the meat from the baking dish with a large spatula and slice it as thin as you are able with a serrated knife. Fry the slices in olive oil, adding more oil if necessary as you go, until deep golden brown, turning occasionally. Pile the meat in pita bread and top with Rich Mans Salad and Yogurt Sauce. Lofty, bold statement, I know, but this here Fresh Herb Vinaigrette is hands down the best dressing I’ve ever thrown together, friends. It’s a flavor bomb, in the lightest, most gorgeous way possible….and will be a new staple in my kitchen without a doubt! 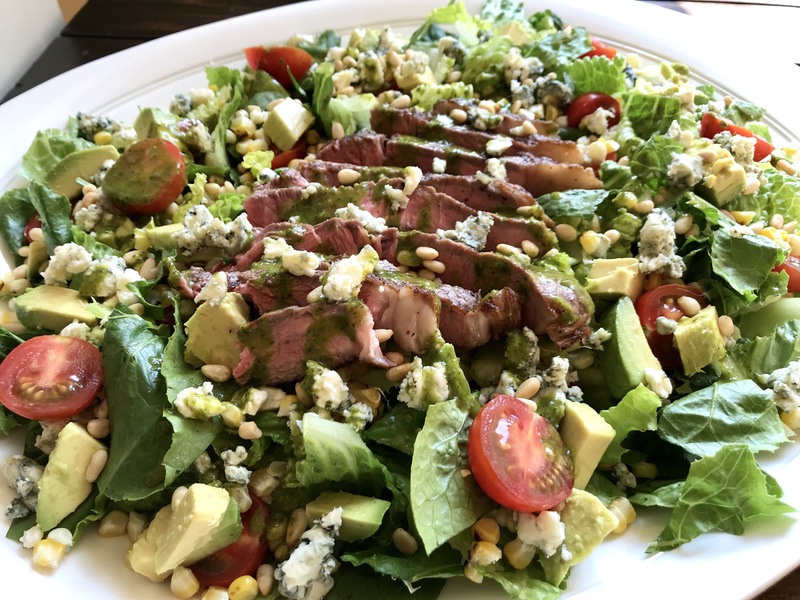 And when you drizzle in on the whole crunchy romaine, summer-ripe tomato, creamy avocado, tangy bleu, sweet corn deal you just might loose your marbles. 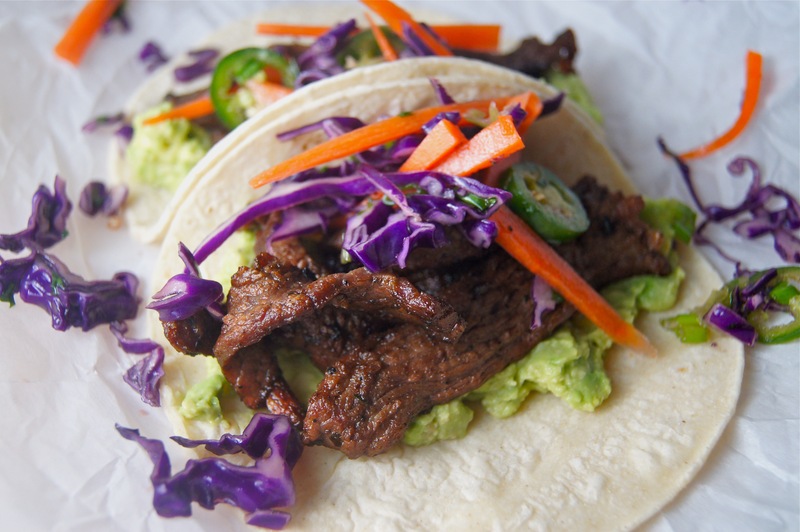 But when you add perfectly grilled, savory steak to the mix….and a bit of toasted pine nuts for crunch…I can’t. I just can’t. Speechless….Likely because my mouth will be stuffed full of this wonder as much as humanely possible this summer. Twenty five thumbs up for this one, guys!!!! 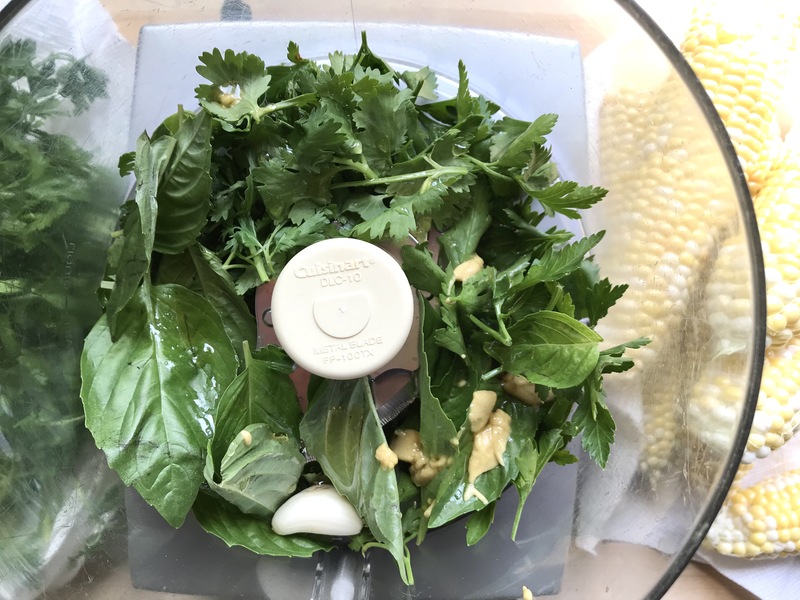 Place parsley, basil, cilantro, garlic, vinegar, honey, Dijon, salt and pepper into the bowl of a food processor and run the motor until combined. With the motor running, stream in the Olive Oil and process for one minute. Serve immediately or store in a glass jar in the refrigerator for up to four days. Preheat outdoor grill over medium high heat. Rub the steaks with olive oil and season both sides liberally with salt and pepper. Place steaks and corn on the grill. Cook steaks for about 8-10 minutes total, flipping halfway when the first side is nicely charred. Remove from heat and let sit uncovered for 10-20 minutes to rest. After resting slice the steaks against the grain into strips. Cook corn until nicely charred all over, turning often as it browns. Remove from grill and slice the kernels off of the cob. 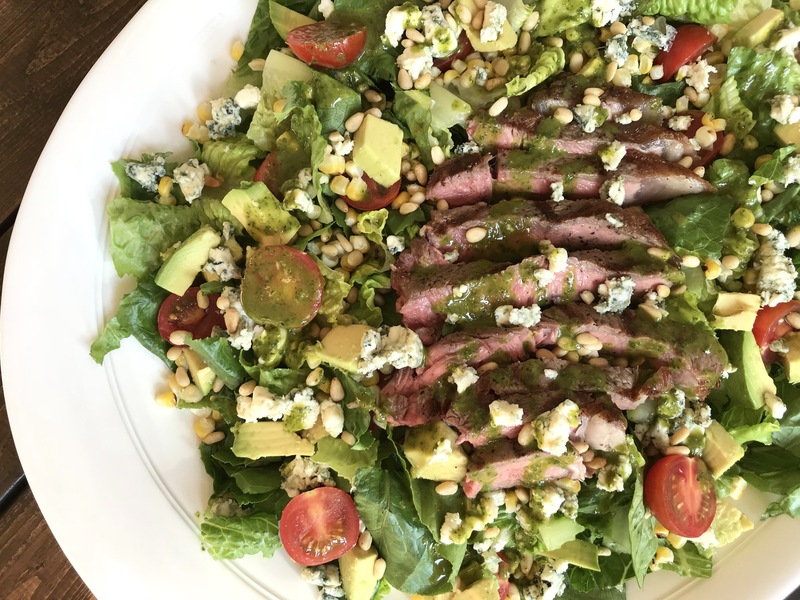 Lay romaine on a serving dish and top with corn, avocado, tomatoes and bleu cheese. Top with sliced steak and sprinkle with pine nuts. Drizzle the vinaigrette over the top and serve. Serves 4 as a main course.